Anti-pill fleece covered wire frames to create soft alternatives to shelves and additional safety catchers for long drops. Attach to any wire cage roof or wall, these rest against the size of your cage to sit level. Watch your rats bounce on and off these soft shelves, or simply sit for a sleep or snack. Anti-pill fleece covered wire frames to create soft alternatives to shelves and additional safety catchers for long drops. 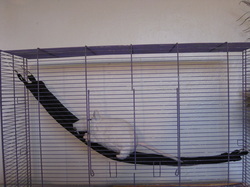 Attach to any wire cage roof or wall, these rest against the size of your cage to sit level. Watch your pets bounce on and off these soft shelves, or simply sit for a sleep or snack. Cosy Double Cuddle hammock. Cosy anti-pill fleece on the inside, polycotton layer on the outside. Quilt-stitched to minimise chewing. 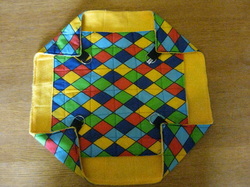 The two squares are joined at the corners to give two levels and four entrances. Great for sharing, sleeping, playing, hiding. Hangs from the top of your cage. Current regular size is suitable for up to four rats, or any mouse, hamster, rat with a generous sized cage. 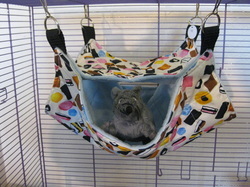 Larger size of the Cosy Double Cuddle for larger groups of rats and cages. Made with four layers of anti pill fleece, super padded cosy carry bag for bonding and playing with or carrying your pet rats. Cosy Bunk hammock. Cosy anti-pill fleece on the inside, polycotton layer on the outside. Quilt-stitched to minimise chewing. The two layers are joined using strong webbing to give two levels and two entrances. Great for sharing, sleeping, playing, hiding. Hangs from the top of your cage. With a solid plastic tube, snugly covered by anti-pill fleece which wraps through the middle, out over each end and joins with velcro on the outside. Like your traditional tube hammock but with the added stability of the solid inner tube for a snuggly safe place for your little pets. Covers can be removed and washed for easy cleaning. 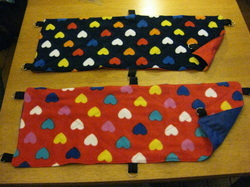 Fleece is lined in cotton and stitched to reduce the impact of chewing. Available in a variety of patterned fleeces. 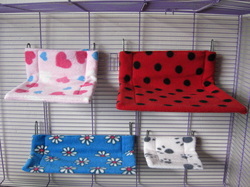 Three sizes available - large is suitable for 3-4 rats/1small ferret, medium is suitable for 1 small rat/hamster, small is suitable for gerbils/mice. 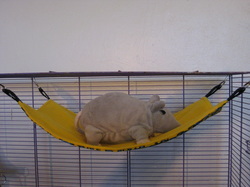 Made with a layer of anti-pill fleece and cotton these long hammocks fit across the wider cages to provide additional levels and protection from long drops. Sizes are excluding the tabs and any clips used. 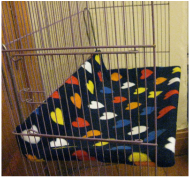 Made with a layer of anti-pill fleece and a padded layer of calico, and wide elastic bands to fix over each corner, these cage liners provide a 4mm thick, comfortable liner for the explorer trays. Quilt stitched to reduce chewing. Use a deep tray in your explorer? These liners can be snugly used inside. 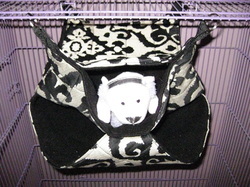 ﻿Custom made to order, topped with fleece, lined with quilted fabric and 4oz of soft comfy wadding inside. I have plenty more designs in mind, which will be coming available over the coming months. Please contact me if you would like to join my mailing list to hear about new products.